Whether you wear braces or not, protecting your smile while playing sports is essential. Injuries to the mouth and jaw are some of the most common injuries received by athletes. 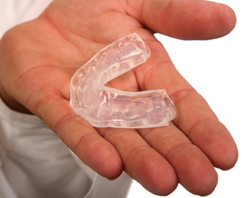 Mouthguards help protect your teeth and gums. If you participate in basketball, boxing, hockey, football, gymnastics, lacrosse, martial arts, racquetball, rugby, track and field, skateboarding, skiing and snowboarding, skydiving, soccer, surfing, volleyball, water polo, weightlifting or wrestling, it is recommended by the Canadian Dental Association that you wear a mouthguard.